Trying to look at things over water is a challenge within itself. This means that the binoculars used must really be made for this type of exploration. They also need to have plenty of features that will allow them to not only do the job but also do it perfectly. This article explains what you should look for when purchasing a high quality set of marine binoculars. We’ve also listed our Top 3 Marine Binoculars for 2019. Quite naturally, marine binoculars must be waterproof. Just know that there are various types of available waterproofing. A lot of vendors say that they have waterproof binoculars, but they are only protected against water. Make sure that you get binoculars that contain an O-ring seal and are nitrogen purged. This signifies that the body has been charged with dry nitrogen gas that stops the fogging, which usually occurs when the temperatures change very quickly. This will make sure that your marine binoculars are protected from all types of water and moisture and will not fog up. This also means that the inside of your binoculars will have protection from corrosion, which will be an added benefit if you like to use them while out on the ocean. When out at sea, your goal will be to find subjects that are in a distance, more so than what you would expect if you were on dry land. The larger the magnification, the better your view will be. However, there is a major problem with this logic. High magnification will cause problems trying to stabilise your image. So, considering the fact that the deck of a boat is not stable anyways, your expensive high-powered binoculars will be almost impossible to use! Your image will never be stable enough to view. This is why the majority of marine binoculars usually have magnifications of around 7x. This will give you enough power to view your images without causing any stabilisation problems. If 7x magnification is too low for you then you should get binoculars that have image stabilisation built into them. 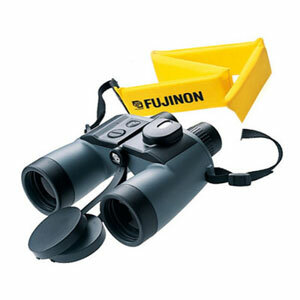 Basically, use marine binoculars that have 7x magnification and if you need more, then use IS binoculars such as the Fujnon Techno-Stabi 14×40 binoculars or other waterproof stabilised binoculars. This specifies the size of the lens at the tip of your binoculars. Large objective lenses can gather more light, which will result in a brighter image. This is something that should be taken into consideration if you plan on using your binoculars during early morning, dusk or nighttime. Naturally, larger lenses will mean larger and heavier binoculars. Usually, marine binoculars are used on a boat, so this is not a problem. Most marine binoculars have objective lenses of 30mm to 50mm. Your FOV is the horizontal width of what you can view when looking through your binoculars. 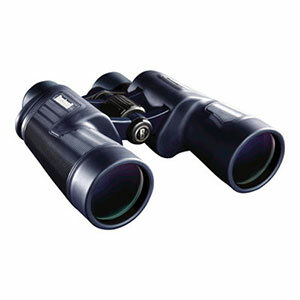 With a wide field of view, it is easier to instantly locate subjects when you are looking through your binoculars. When on the water, it allows you to spot different subjects and see more of them in your view. For example, you could see other boats in the distance. A lower magnification will mean a wider FOV. A view that is too wide will distort your images along the borders. So, you need to get a wider field of view at the right magnification. For marine use, 7×50 binoculars are the perfect balance between magnification, lens size and FOV. When it comes to the size and weight of your marine binoculars, it really doesn’t matter. They are usually kept on a boat and only utilised when on the water. If you want to use them for other things besides boating adventures, then this might become a problem. 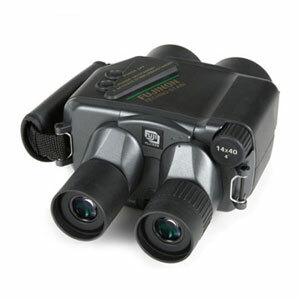 Some marine binoculars are available with an integrated compass. You can pinpoint the bearing of a particular subject. It will depend on your needs, but this is something that is an added bonus. If you find that you do need this particular feature then make sure that you get a compass that illuminates during the night time hours. Quite naturally, these will require the usage of batteries. Have you ever considered what would happen if your binoculars fell into the water? Some marine binoculars can float; the majority of them do not. So, get a floating strap that you can attach to your binoculars. This will make sure that they stay on top of the water long enough for you to get them out. Certain models such as the Fujinon 7×50 Mariner are available with a floating neck strap. Some marine binoculars are not available with this particular feature, which means that you will have to purchase the floating strap separately. 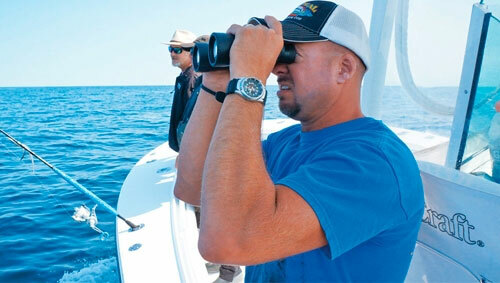 It is important that marine binoculars are not only waterproof but also stable when you are out in high seas. The Fujinon Mariner 7×50 WPC-XL binoculars have both of these features covered. They are 100% waterproof and even float in water when used with the included floating neck strap. They are also nitrogen-purged, fog-proofed, comfortable to use and highly durable. The 7x magnification will allow you to look at things in the distance, but also give you the ability to view your subjects without any stabilisation problems. This is especially functional whenever the waves are high. The image quality on these is superb and highly rated by Fuji binocular users. The very wide (7 degrees) field of view together with the bright images produced by the 50mm lenses is simply remarkable. These features are handy for marine use as you can spot approaching boats easily even in poor light conditions. The Fujinon 7×50 WPC-XL marine binoculars have a digital compass, for day and night use, visible through the eyepiece. The compass is universal so works in both Southerns and Northern Hemisphere. If you don’t need the compass you can save around $50 and choose the Fujinon 7×50 WP-XL Mariner. These are exactly the same binoculars excluding the compass on top. The Fujinon 7×50 WPC-XL Mariner are our top-pick marine binoculars as well as our best-selling waterproof model. They are currently priced at $365, which is a bargain for what you get with them. If you want good quality marine binoculars without breaking the bank then the Bushnell 7×50 H2O are a good pick. Bushnell are experts in producing excellent optics at low prices and this marine model is no different. The 7x magnification is handy for using the binoculars in and out of the water. As far as waterproofing, fog proofing and wide field of view this model matches any other high quality marine binocular. Although the Bushnell H2O have perfectly good lenses, you might find the Fujinon binoculars optically better with sharper and brighter images. In conclusion, the Bushnell 7×50 H2O are a steal for their price range ($269) and a solid choice as marine binoculars. For the professional mariner or more frequent user, there are probably no better than the Fujinon 14X40 Techno-Stabi binoculars. These were specifically designed to provide a sharp and stable image in ANY kind of settings. You will enjoy the strong 14x magnification while still be able to view, follow and focus on your subject with ease. The image stabilisation mechanism can be powered by either AA batteries or a power adaptor. They can also be used as “normal” binoculars without the image stabiliser. Another cool feature of the Fujinon 14X40 Techno-Stabi binoculars is that they stabilise the image in every direction and every possible movement of the viewer. This makes them ideal for use on airplanes, helicopters or boats. This model is a favourite by Australian navy, law enforcement, SLSC clubs and other professionals. Optically the Fujinon 14X40 Techno-Stabi deliver high quality, bright images with excellent sharpness and colour reproduction. On the downside, these binoculars are on the heavy side at around 1.2 Kg. They are also not the most beautiful product on the market. But don’t let their looks fool you! These are a brilliant and powerful tool for marine use. The Fujinon 14X40 Techno-Stabi binoculars are available on Procular at a highly discounted rate of $1699 including free delivery and a hassle-free manufacturer’s warranty. If conditions on the water are usually pretty glary, would the Fujinon 7×50 let in too much light? As you can read in the post above marine binoculars do not have anymore than 7x magnification because of image shakiness when used at sea (on top of a moving platform). The only high powered marine binoculars are the image stabilised ones. We can recommend the Fujinon 14×40 for example which have 14x power (twice than other 7×50 marine binoculars) and also image stabilisation. Details below: https://procular.com.au/fujinon-14×40-techno-stabi-is/ — to connect a camera to them you will need a special adapter, depending on the camera used. Here’s the 3 adapters below: https://procular.com.au/accessories/camera-adapters/?filter_brand=939 (for Canon, Nikon or mobile cameras). We are unaware of another option as other marine binoculars are not high powered and do not have a camera built in. If you’ll be over the waters (i.e. fishing from a boat) then 7×50 marine binoculars would be the best option. The 3 models recommended above will work. But if you will be on land and simply need to spot the fish in the river then a good pair of 10×42 or 8×42 will work better. We can highly recommend the Avalon 10×42 PRO HD model below: https://procular.com.au/avalon-10×42-pro-hd-binoculars-black/ they have a nice clear image and are very comfortable to use. They are also waterproof and fog-proof. Do you think a Bushnell 9×32 monocular would be good for yacht racing? I need to pick out a distant buoy sooner than my naked eye allows. With the Bushnell monocular you will be able to pick out a distant buoy. The problem is though that your field of view is limited and because you are in a fast moving (and shaking) environment it might take you quite a while to achieve a stable image and to locate the buoy with this monocular. Adam are there any real benefits/drawbacks to polarized lenses in marine binoculars and do any manufacturers make polarized marine binoculars? Hi Thomas, this is a very good question. If you are watching a school of fish on a clear day using a 7×50 binocular you can identify species from up to 1 Km (roughly). But there are a few elements to take into consideration such as the glare over the water, the size of the fish i.e. area where the fish are swimming, if they are silver/black and how much light there is – sunny day vs. foggy or rainy conditions. This is where the quality of your optics really come into play! 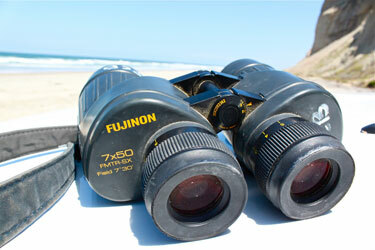 We always recommend Fujinon binoculars for marine use because they have the maximum light intake in the industry. Up to 95%. This gives you a brighter image that helps you see in better details. Especially in poor light. In any case 7×50 binoculars will always be the ideal choice because you will not be able to achieve a stable image with anything stronger than that. You can look at the Fujinon 7×50 Mariner (https://procular.com.au/fujinon-7×50-wp-xl-mariner-binoculars/) or the even brighter Fujinon 7×50 FMTR-SX (https://procular.com.au/fujinon-7×50-fmtr-sx-polaris-binoculars/). One more note, if you can afford the image stabilised binoculars (for example Techno-Stabi 12×32: https://procular.com.au/fujinon-12×32-techno-stabi-is-binoculars/) you will be able to see and identify fish from even further away and in more detail. They stabilise the image perfectly and are designed for marine use and use over high waves where it is difficult to use any other binoculars. We hope this helps. Any questions about the binoculars please fee free to let us know. Regarding the fujinon 7×50 wpc-xl…can /are the eye pieces able to be independently focused? Yes, the eye-pieces on the Fujinon 7×50 WPC-XL binoculars can be individually focused. This is a nice and also common feature in marine binoculars.